Torta de pane al cioccolato. I love saying that. With the "r" emphasised with the rolling of the tongue on the inside roof of the mouth. Rrrrr..... I have in many posts, not just in this recent one, blogged about loving the Italian culture and hoping someday to visit the country and do a self-drive tour with hubby. Sipping vino with the locals and indulging in the rich culture and food. In the meantime, this is reality. Browsing of tours and travels from magazinges, newspapers and online. Sigh. Now back to reality. 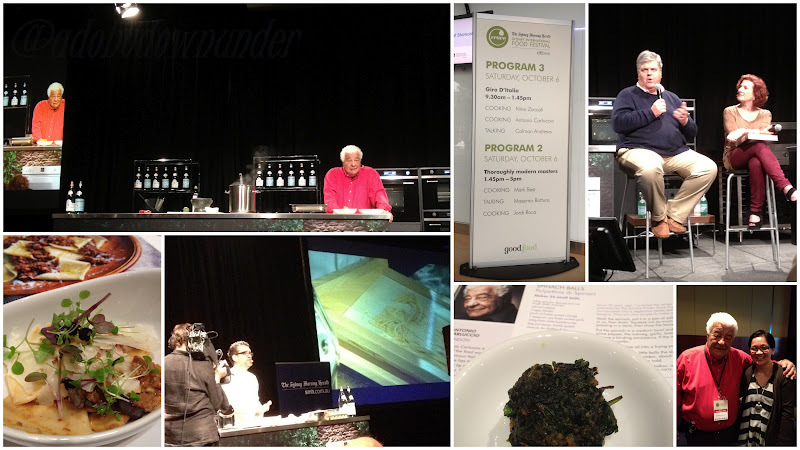 During the weekend, I attended one of the World Chef Showcase sessions as part of the October month-long Crave Sydney - Sydney International Food Festival. It's my second year going and its always a lovely treat to be amongst people who have the same interests - FOOD! The morning session was a Giro D'Italia - Tour of Italy theme and of course, the maestro and godfather of Italian cooking was there himself - the other half of the Two Greedy Italians, Antonio Carluccio. Charming, full of wit and humour and years of wisdom of the cuisine that he is so passionate about which included some tasting of his famous spinach balls (which shall be for a future post). Local Sydney chef and owner of Pendolino and La Rosa, Nino Zoccali also showcased his amazing skills in pasta making and shared a most tantalizing pasta dish of Priests' hats pasta with Calabrian wild boar sauce. James Beard Foundation awardee Colman Andrews - founder of Savuer magazine and online foodie resource The Daily Meal, did a brief talk about his adventures into the Catalan cuisine from his book and more on his latest book on Ferran Adria - The Man Who Changed the Way We Eat. Overall, the day was magnifico! So while I can only read, dream and sigh of far away places, what better way to learn about other cultures (besides travelling)? Through food! Recipe books, magazines, online, product boxes and labels, supermarket newsletters... the resources are endless. And today, we are touring Italy once again. Giro d' Italia! So let me say what this cake is called again - torta di pane al cioccolate. Chocolate bread cake. Using stale bread! Yes! This is undeniably one of those recipes that will get your attention at the first instance! Who wouldn't want to make use of neglected breads at their home? Well this one caught my attention at the sight of the words: stale and bread, through my Instagram feeds and from the La Cucina Italiana magazine. In a medium sized pot, heat the milk to simmer. Coursely tear bread pieces and place in a large bowl. Pour the heated milk onto the bread and let it soak until fully absorbed. 1-1.5hours. Preheat oven to 175*C. Butter a 25cm spring form pan and dust with half of the breadcrumbs. Prepare a pot with water and let simmer. Place chocolates in a heatproof bowl and set over the pot until melted. Stirring occasionally until smooth. Set aside. In the bowl of an electric mixer, beat together sugar and egg yolks until light and fluffy. Add butter and continue to beat until mixed through. Drain the bread mixture over a sieve. Add the bread mixture, melted chocolate and almond meal to the creamed batter and beat until well combined. In a separate bowl (squeaky clean as you want the egg whites to aerate properly and get the desired peaks), whisk the egg whites with a pinch of salt to soft peaks. Gently fold the egg white meringue to the batter using a spatula, slowly and carefully folding to prevent collapsing the aeration. Pour the batter into the prepared pan and dust with the remaining breadcrumbs. Bake for 1 hour at 175*C then reduce to 150*C and continue baking until tester inesterd comes out clean, approximately 45-60 minutes more. Transfer cake to rack and cool for 10 minutes. Serve dusted with icing sugar, and optional chocoalte shavings. So what do you make of these kinds of recipes? Like one-bowl cake recipes, this is an absolute delight to make and eat. Although it takes a bit of time than most cakes, the curiosity and anticipation after you've taken your first bite just disappears with the richness of the moist cake and that crusty top. Its something you'd have to try, again and again. I think this recipe is an absolute pantry saver. A welcome treat. Have you ever seen those lucky dip baskets at fetes? Whether you had it during your primary years (grade school days), or see it often at your child's school, these are simple fun thrills for kids. Even the child-at-heart. Not a clue what I'm talking about? Imagine this - either a basket or a box, or a hat even. You dip your hand in and pull out a surprise! Whatever it is, its always something of a treat: a small toy, lolly, stickers (who doesn't like stickers?! ),or even a recipe that will help you save those last pieces of bread! After making this, I think we'll want to buy more bread and let them go stale.